Your lawn, trees, shrubs, and flowers are an investment that increases the value of your home. When you invest money in your outdoor living area, it only makes sense to take care of your landscape in order to prolong its life and provide years of enjoyment. A little TLC (tender loving care) goes a long way to help maintain a beautiful yard and protect your investment. Fertilizing your lawn and applying insecticide treatments will help it stay healthy and free of harmful insects. Our customized lawn care program consists of 6-7 annual treatments. Each visit has a unique application for the type of grass in your lawn and the time of the season when the application is being made. 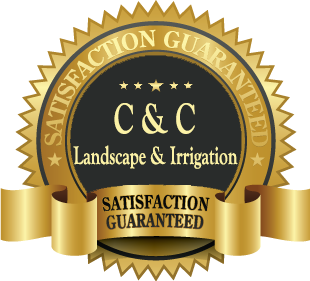 The program includes fertilizer for your lawn, post-emergent and pre-emergent weed control, insecticide treatments, fungicide applications, sprinkler system checks, and soil aerating. Listed below is a typical annual lawn maintenance program with treatment explanations. Prevention of pests and weeds is key to ensure your yard stays healthy and looking the best that it can year round. Weather conditions, proper lawn maintenance, and correct irrigation coverage and settings all are important to get the most out of any lawn treatment program. NOTE: Bermuda lawns are getting more pre-emergent weed control than St. Augustine because the grass grows thinner and is more prone to weeds. There are no fungicide treatments for Bermuda as it is not common to get brown patch. 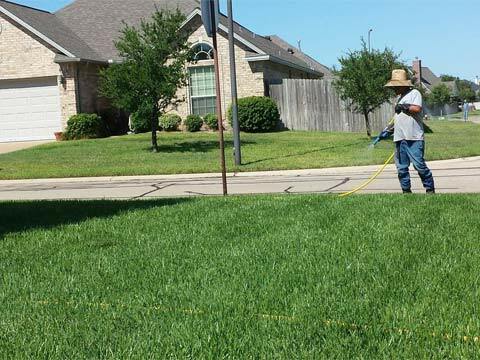 Lawn aeration is very important, especially in Brazos County, since our soil is predominantly clay. Aerating your lawn will de-compact the soil. We do a core aeration that pulls a plug from the yard which leaves a cavity so roots can grow. Pulling these plugs allows oxygen, water, and nutrients to get to the root zone. It also controls thatch, which is a dead layer of grass. Give the trees in your landscape a little help to prevent stress, disease, and insects with our Deep Root Feeding Program. Our trained staff puts the fertilizer and root stimulators directly in the root zone with no wasted or overused chemicals. This is a very cost effective treatment program that yields great results. This is a separate program from the above scheduled lawn programs and can be added at your convenience. It consists of 6 visits annually.